Calling card of James C. Phelps; nothing on reverse. 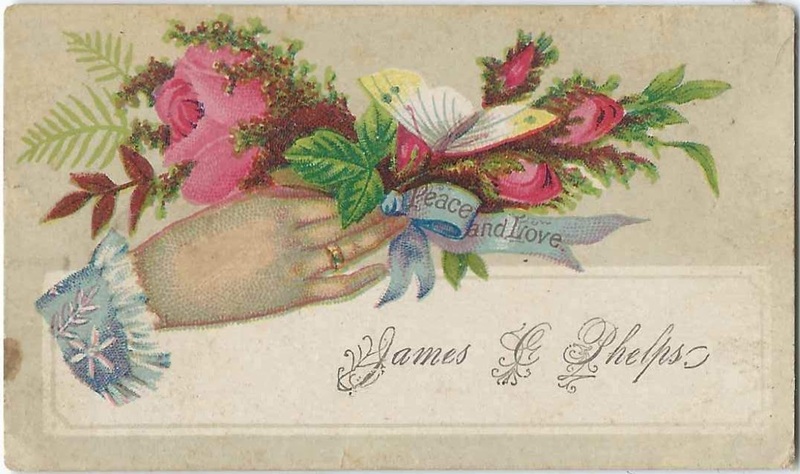 The card came with a collection of cards from Maine and Massachusetts, but James may have lived anywhere in North America. If you know of a James C. Phelps who lived during the hay day of calling cards, please leave a comment or contact me directly. 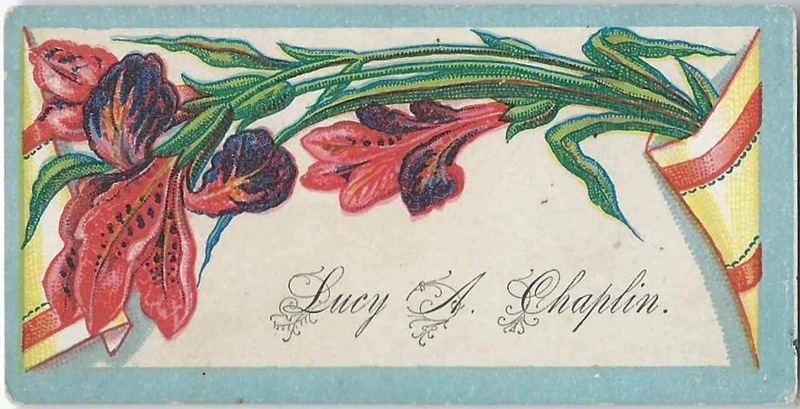 Calling card of Lucy A. Chaplin. 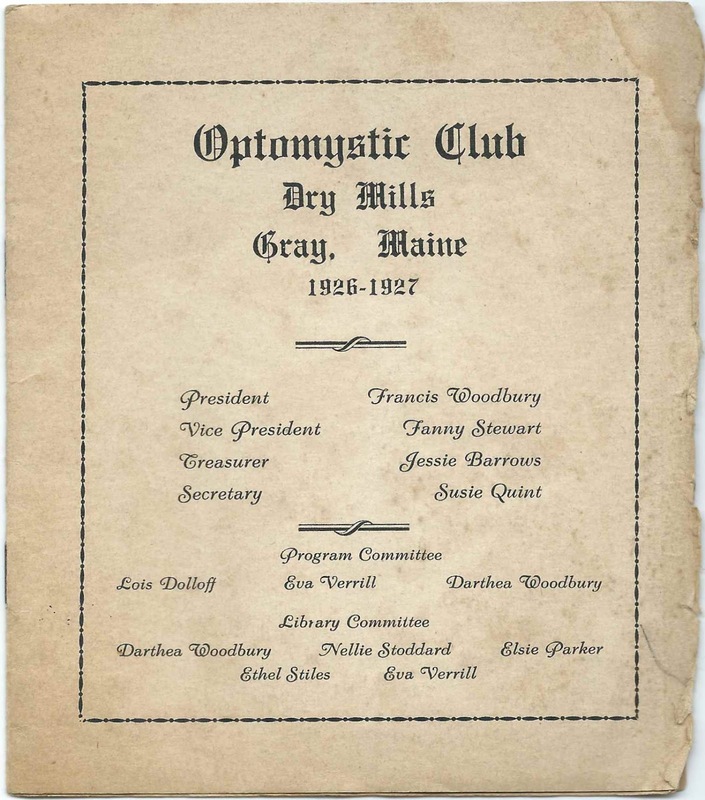 Nothing on reverse and no clues to locale, except that it was one of a number of calling cards, some of which contained Maine addresses. 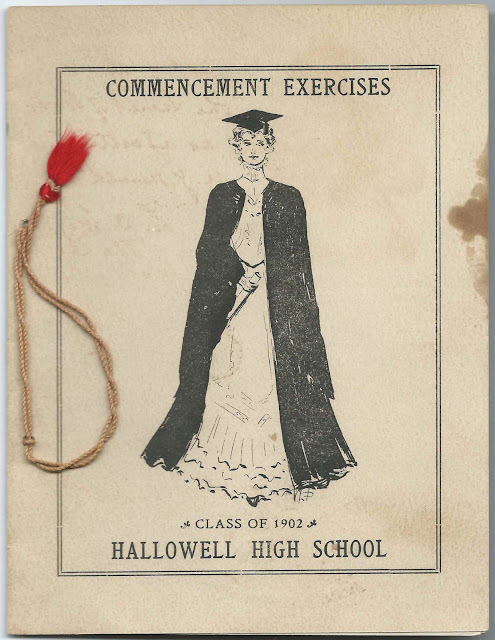 It's possible that Lucy was Lucy Ann Chaplin, born about October 1861, daughter of William F. Chaplin and Mary Rounds (Dow) Chaplin of Naples, Maine, and future wife of Samuel Smith Chaplin, whom Lucy married in 1877. If you know of a Lucy A. Chaplin who lived during the hay day of calling cards, please leave a comment or contact me directly. Just in case the card belonged to Lucy Ann (Chaplin) Chaplin, below is a map of Naples, Maine. Calling card of George G. Ripley and wife Mary (Noyes) Ripley of Massachusetts. According to the Massachusetts record of their January 2, 1859 marriage at Abington, Massachusetts, George, a boot maker, was a native of Paris, Maine, and Mary a native of Abington itself. George's parents were Ranson Ripley and Susan (Lane) Ripley. 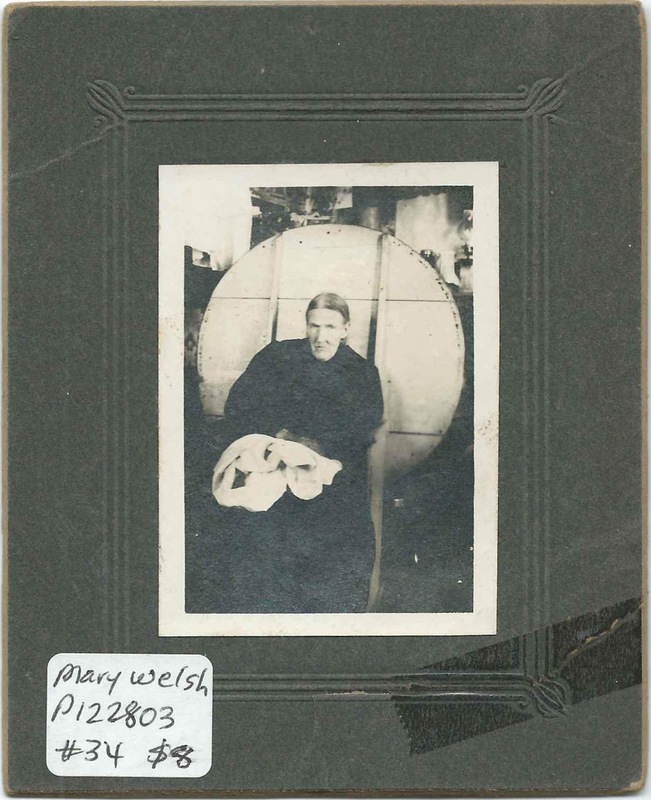 Mary's parents were Isaiah Noyes and Betsey S. (Bosworth) Noyes. Susan's name was left off the marriage record, and Betsey's name did not include her birth surname; these were found by researching their husbands. 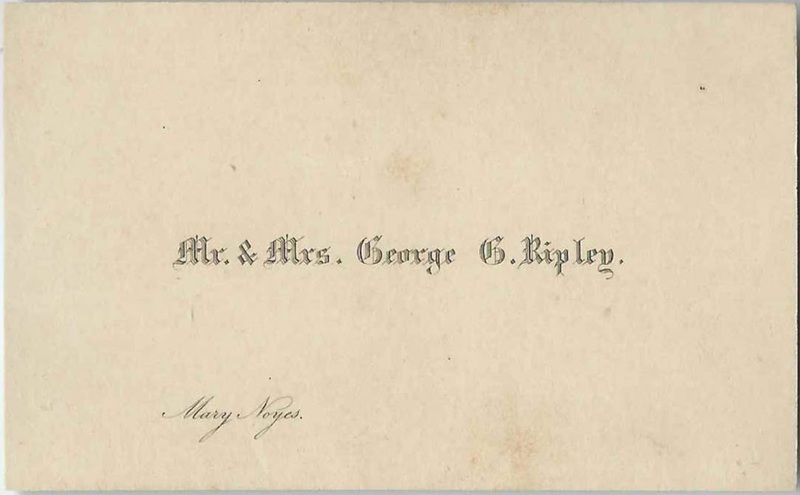 Interestingly, the card was found enclosed in an envelope addressed to Mr. Ranson Ripley, who was presumably George's brother, as the elder Ranson Ripley had died before George's marriage. Ranson, Jr., married Julia M. Thayer. 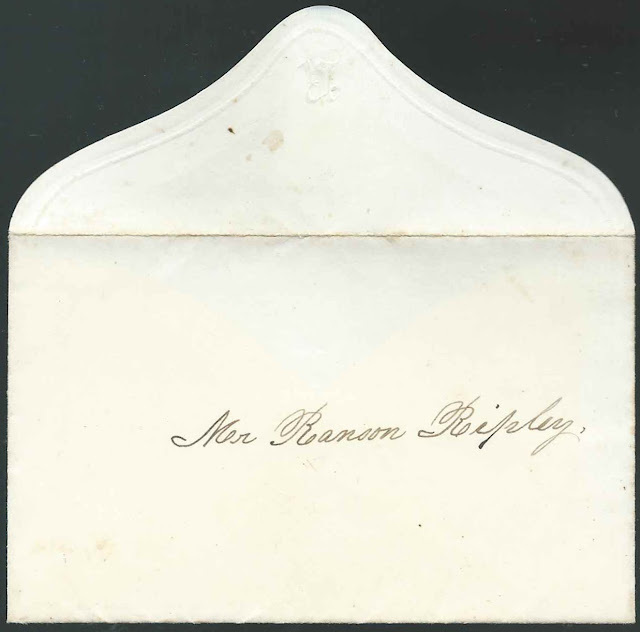 Note: some records show Ranson as Ransom or Ransond, but, in histories of the area, the name appears as Ranson Ripley, just as written on the envelope. It appears that George and Mary moved to the Midwest, at least for a time, but either returned or were visiting when George died at Brockton, Massachusetts, in 1899. If you have more information on the Ripley and Noyes families, please leave a comment or contact me directly. Massachusetts, Town and Vital Records, 1620-1988 - birth record of Mary (Noyes) Ripley - born July 27, 1838 at Abington, Massachusetts, daughter of Isaiah Noyes and Betsey - whose name I found from other sources to be Betsey (Bosworth) Noyes. Faded photograph of "Aunt Anne Nickerson's home up in Brighton, Me." Brighton is a town in Somerset County, Maine. 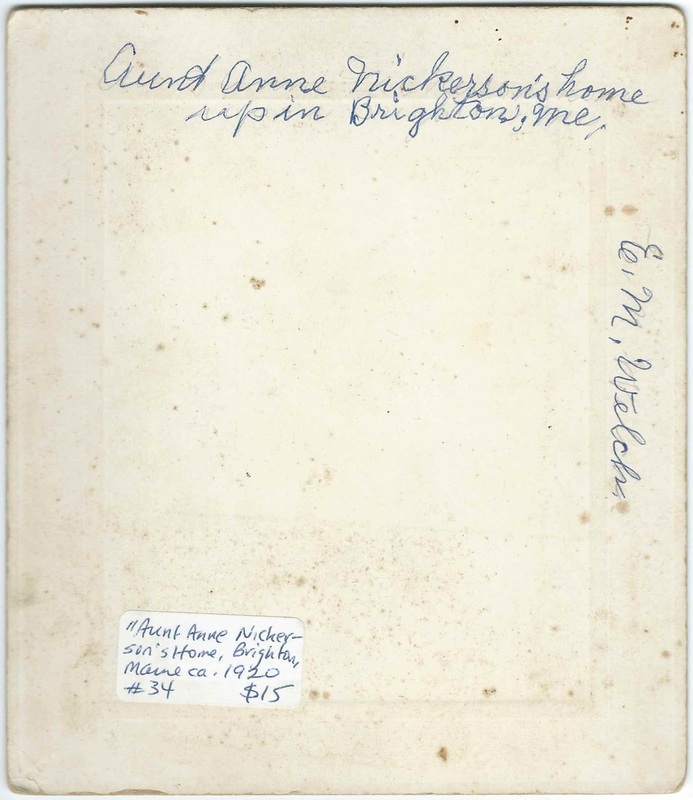 I believe Anne was Esther Ann Nickerson, or Ann Esther Nickerson, daughter of William Nickerson and Thankful (Parsons) Nickerson and wife of her cousin Aaron Nickerson. This Ann(e) died in 1917, to give you some idea of the era of the photograph. Aaron had died in 1902. 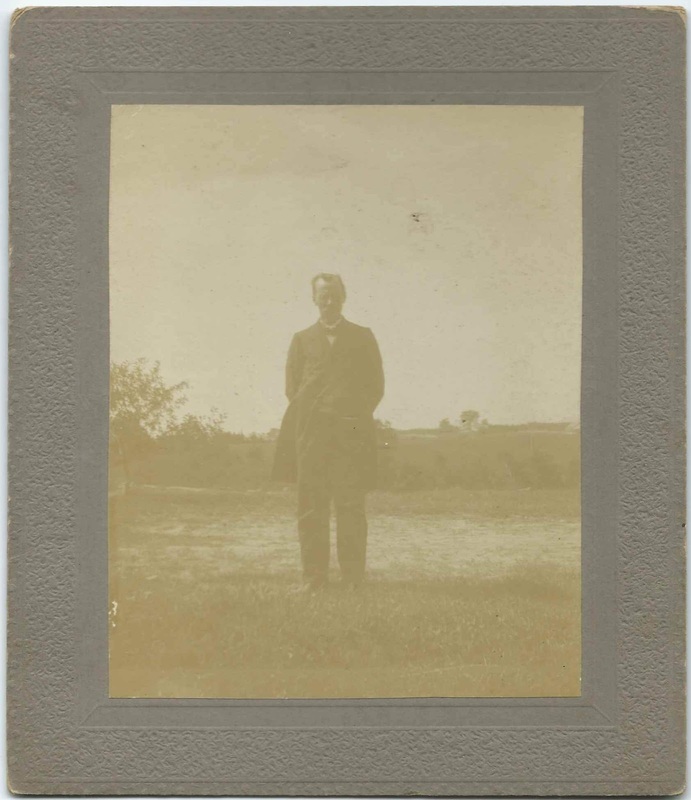 It's very possible that E. M. Welch, the young man depicted in a photograph farther below, was Anne(e)'s nephew or grand nephew, by blood or marriage. Ann(e) and Aaron were both born in New Hampshire, Ann(e) in 1828 and Aaron in 1820. They married about on July 12, 1846, presumably in Maine, as there's a record for them in the Maine Marriages, 1771-1907 database. 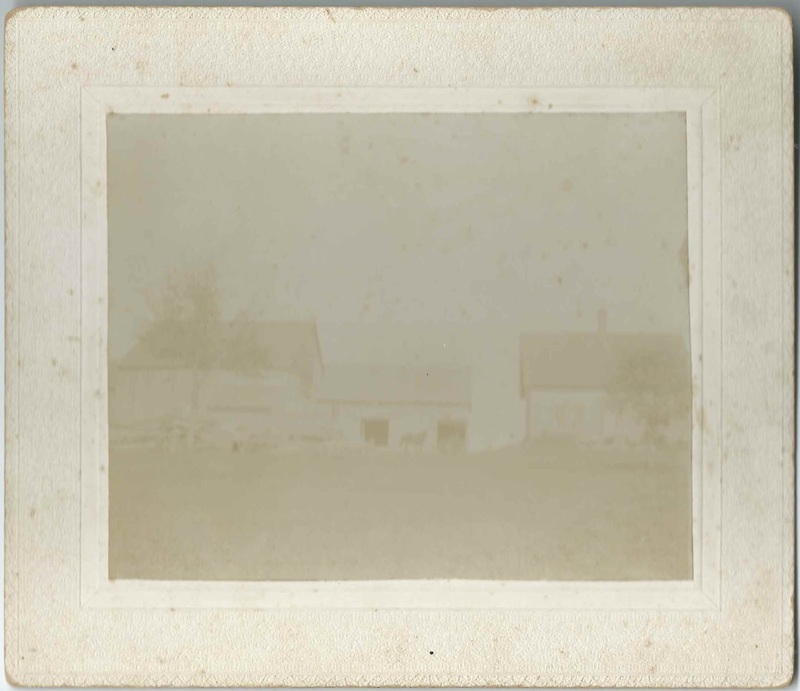 I noticed the the Genealogy Database of the Nickerson Family Association gives the marriage place as Swanville, Maine, but I haven't corroborated that myself. This database also notes that the couple is buried in the Hutchins Corner Cemetery of nearby Wellington, Maine (see the map below). A photograph of an older woman that the seller identifies as Mary Welch, but I believe is actually Ann(e) (Nickerson) Nickerson as the handwriting mentions both names and gives the death date of September 8, 1917, which was Ann(e)'s death date. Ann(e) is sitting on a chair/table. 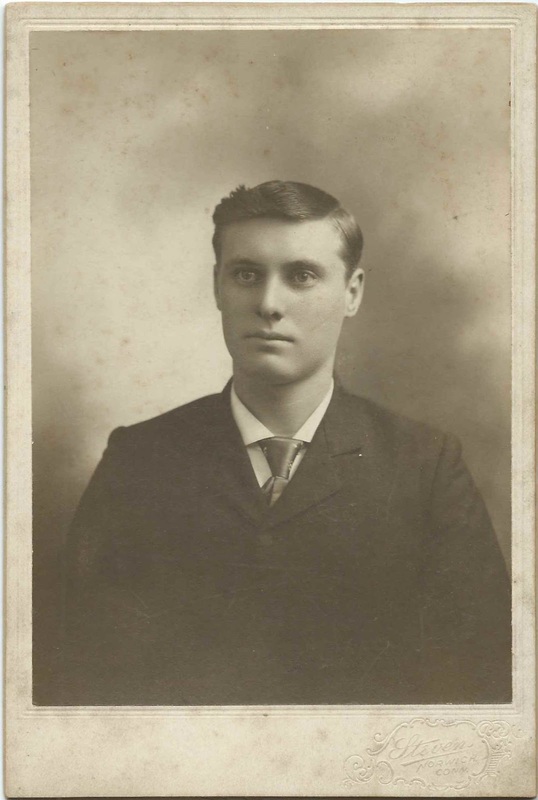 A photograph of young man identified as E. M. Welch, whether the same person or a related person; by a studio at Norwich, Connecticut. He may have been the nephew or grand nephew of Anne(e) and Aaron Nickerson. A photograph of a man with the surname Welch; his given name might have been Horace. If you can determine the proper given name, please leave a comment or contact me directly - thanks! If you are able to tie the Welch family to the Nickerson family, please leave a comment or contact me directly. August 18, 1784 document where York County, Maine, Justice of the Peace Dominicus Goodwin has appointed John Lord and Ebenezer Goodwin, both of Berwick, Maine, to determine the value of a stray mare. Another name mentioned is that of Simon Emery, Jr. Note: The District of Maine was part of Massachusetts until 1820. 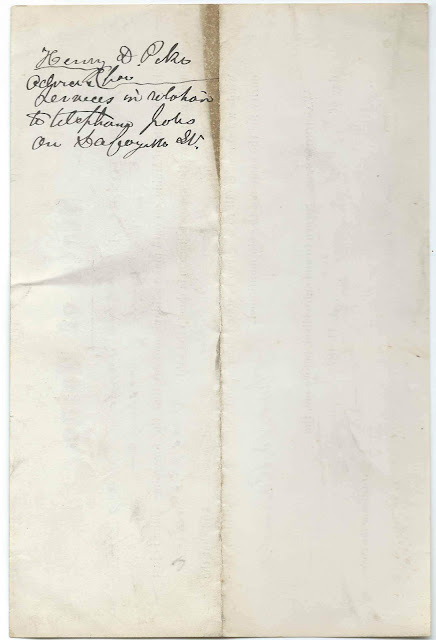 An approximate transcription of the document appears at the end of this post. Feel free to make corrections and suggestions for the blanks. Dominicus may have been Dominicus Goodwin (1741-1807). There were several men named John Lord in the Berwick area. One was a Brigadier General in the American Revolution and father of Nathan Lord, a president of Dartmouth College. 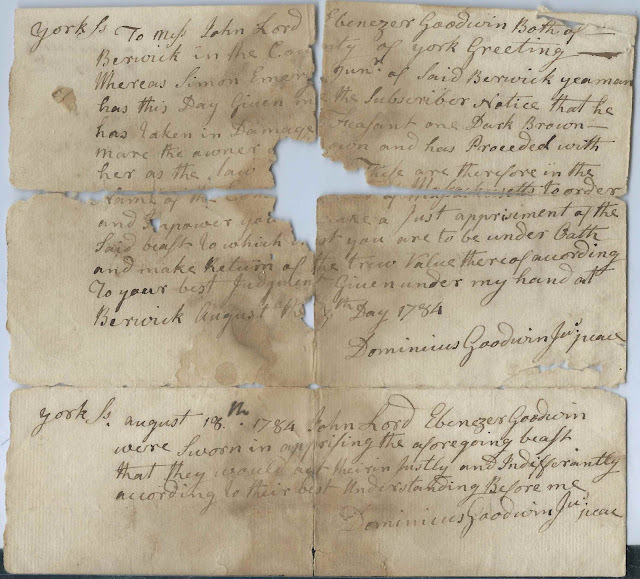 Some sources say that this John was born about 1764, which would seem surprisingly young to have been a Brigadier General in the American Revolution and in a position of trust in his town by 1784. Ebenezer may have been Ebenezer Goodwin (1747-1802). 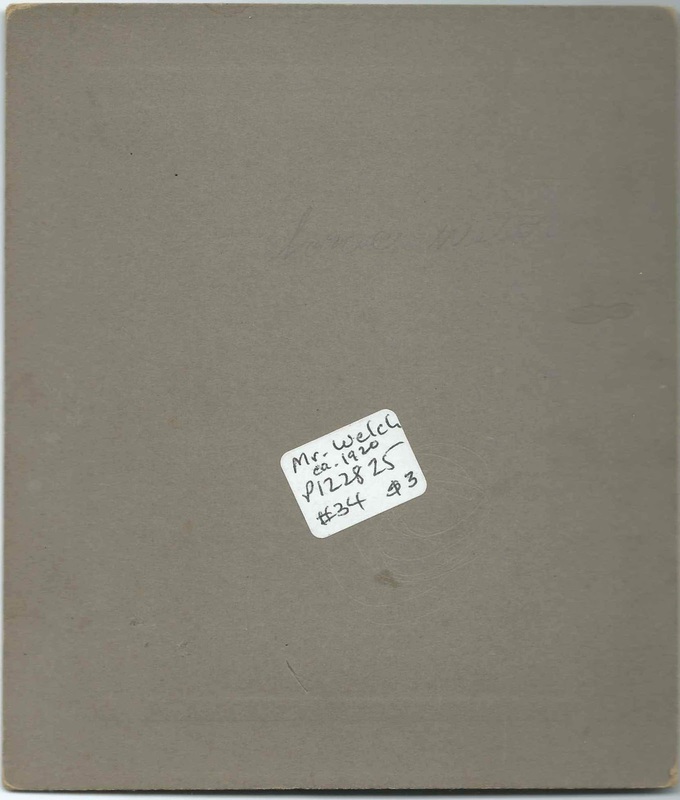 There were a Simon Emery (1727-1795) who lived in the Berwick, Maine area, even at one time at Berwick itself; his father was also named Simon Emery. But I can't rule out that there might have been another father and son named Simon Emery. Whereas Simon Emery Jun. of Said Berwick yeoman has this Day Given me the Subscriber Notice that he has taken in Damage ___ one Dark Brown Mare the owner ____ [unknown ?] and has Proceeded with her as the law _____ are therefore in the Name of ___ Massachusetts to order and Empower you ___ make a just apprisement of the Said beast to which ___ you are to be under Oath and make Return of the True Value thereof according to your best judgment. Given under my hand at Berwick, August the ___ Day 1784. If you have information on any of the men mentioned in this document, please leave a comment or contact me directly. 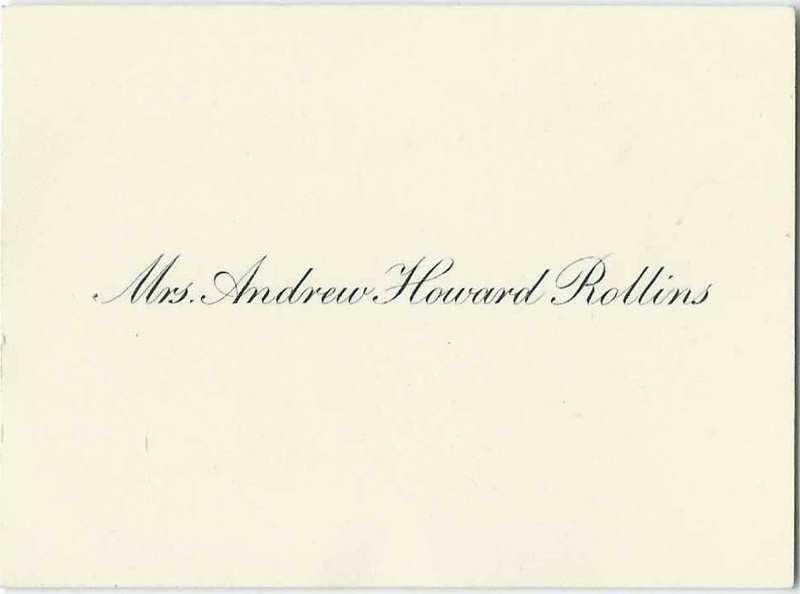 Calling card of Mrs. Andrew Howard Rollins; nothing on reverse. Victorine Bellatty Wyman, whom he married on October 5, 1910. Victorine, daughter of Edward Benjamin Wyman and Ernestine (Bellatty) Wyman, was born in 1883 and died in 1954. Mrs. Beulah H. (Bunker) Blance, whom Andrew married on August 1, 1963 - Maine, Marriage Index, 1892-1996. 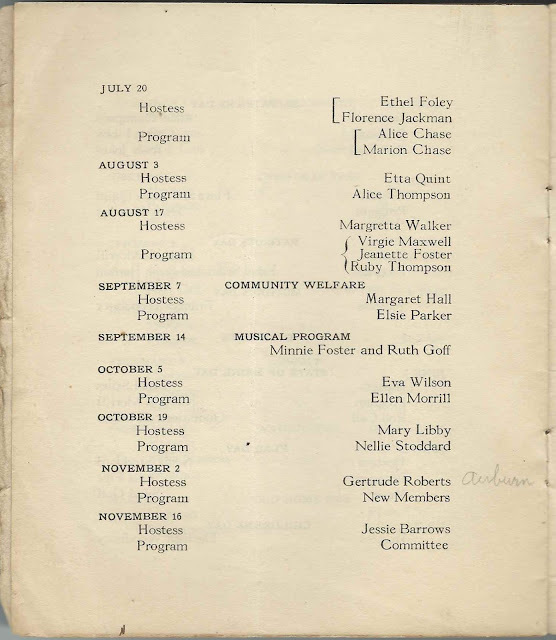 Beulah, born in 1897 at Gouldsboro, Maine, was the daughter of Henry Bunker and Mary (Bunker) Bunker. Beulah's first husband was George C. Blance, with whom she is buried in the Greenwood Cemetery at Winter Harbor, Maine. She died in 1976. Andrew Howard Rollins died in 1973. It's possible that the calling card belonged to either of Andrew's wives, but I'm leaning toward first wife Victorine. If you know of another Andrew Howard Rollins, please leave a comment or contact me directly. 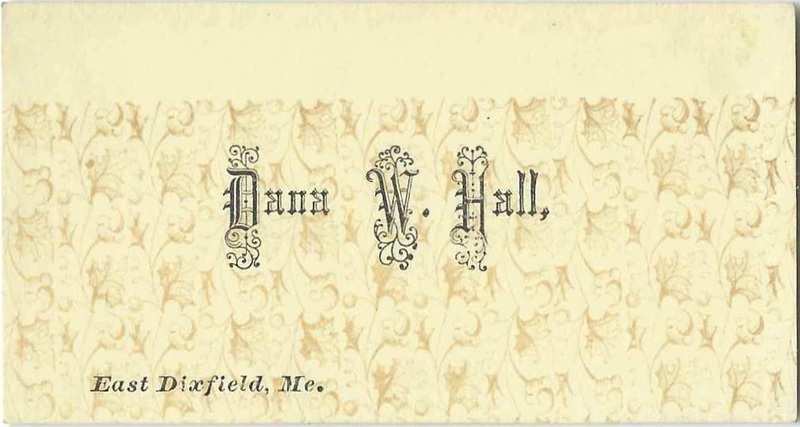 Calling card of Dana W. Hall of East Dixfield, Maine; nothing on reverse. 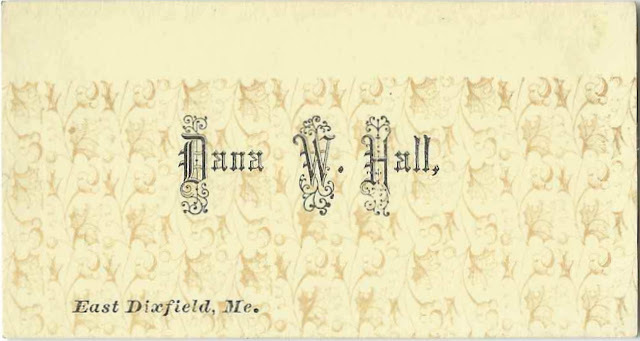 Odds are that this was the calling card of Dana Warren Hall, born April 4, 1866 at Wilton, Maine, son of Warren W. Hall and Eliza A. (Morse) Hall. 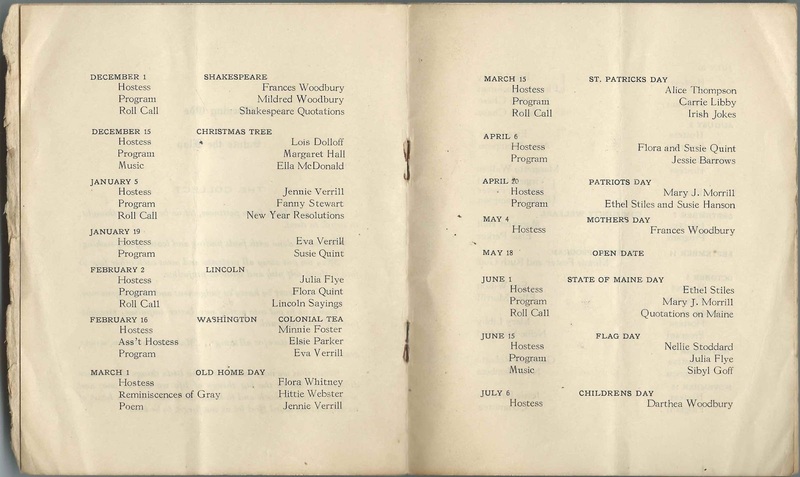 By 1900, Dana was living at Chicago, Illinois, and working as a Solicitor (Books), whatever that meant, and was still working in the publishing industry at the time of the 1910 Census of Chicago. In the 1920 Census of Chicago, he gave his occupation as publisher. 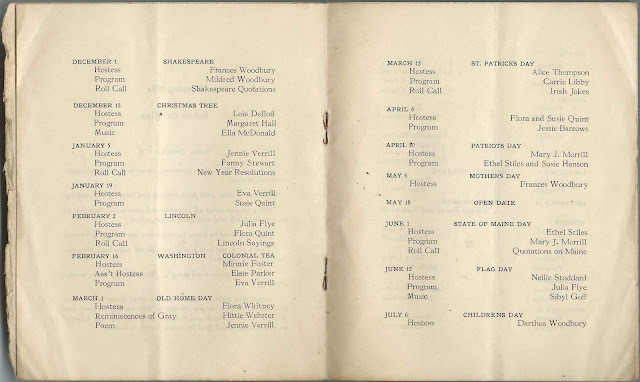 On April 2, 1910 in Chicago, Illinois, Dana Warren Hall married Imogene Donovan, who was born in Connecticut, daughter of Timothy Donovan and Imogene A. (Ferry) Donovan. Dana died in 1926 in Chicago, Illinois, and is buried in the East Dixfield Cemetery at Wilton, Maine, in the plot of William D. Adams, according to the Nathan Hale Cemetery Collection, Maine, ca 1780-1980. Imogene outlived him and subsequently married Franklin Winslow Johnson, president of Colby College at Waterville, Maine, from 1929-1942. If you have additional information, or if you feel that Dana W Hall of East Dixfield, Maine, is a different person, please leave a comment or contact me directly. 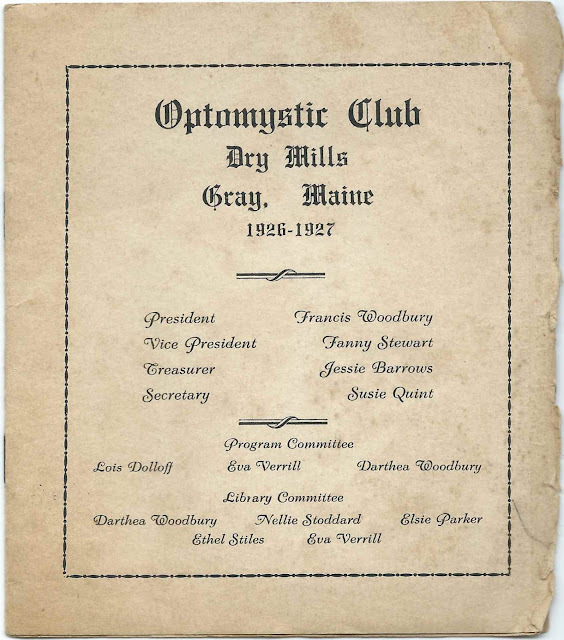 Programs for the years 1926 and 1927 of the Optomystic Club of Dry Mills, Maine, at Gray, Maine. 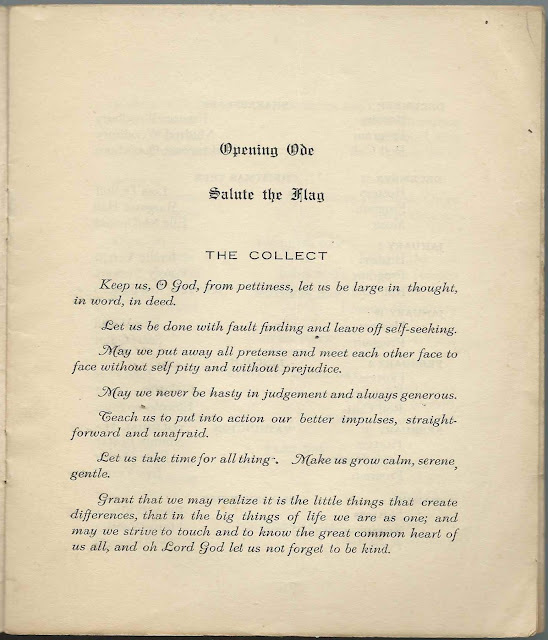 Pamphlet, approximately 5-1/2" x 5", with two interior leaves. If you have information on any of the women mentioned above, taking care to respect the privacy of people who may be living, please leave a comment or contact me direclty. Commencement Exercises of the Class of 1902 at Hallowell High School, Hallowell, Maine, which were held at the First Baptist Church on Friday, June 20, 1902 at 2pm, with a Class Reception at City Hall at 8pm. Approx. 7-1/8" by 5-1/2", consisting of an outer covering and two inside sheets. 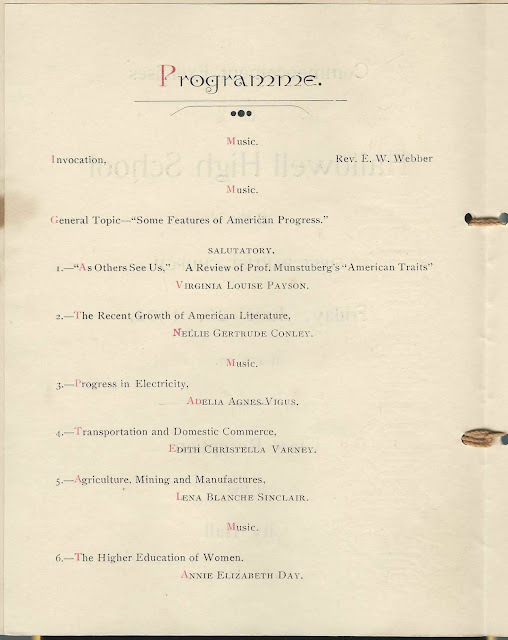 General Topic - "Some Features of American Progress"
2. 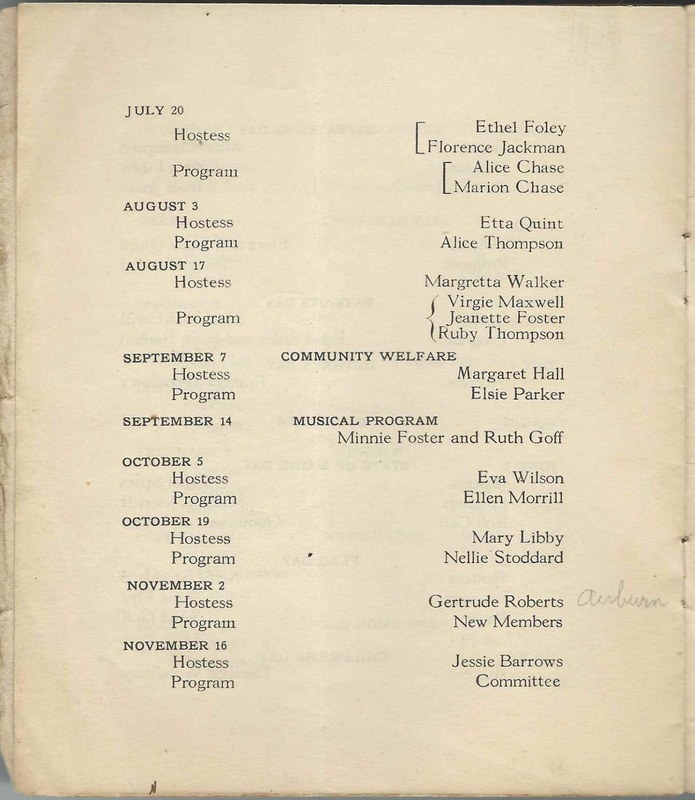 Nellie Gertrude Conley - "The Recent Growth of American Literature"
3. Adelia Agnes Vigus - "Progress in Electricity"
4. 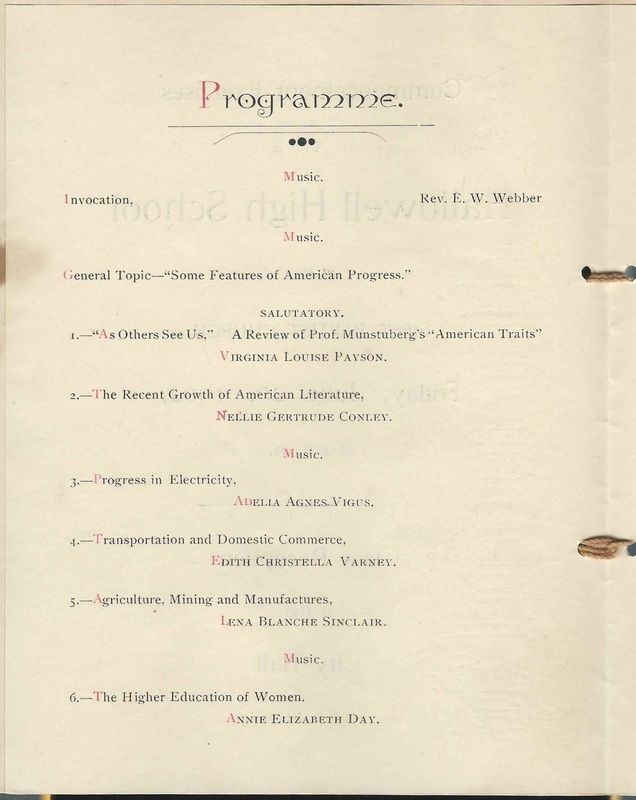 Edith Christella Varney - "Transportation and Domestic Commerce"
5. Lena Blanche Sinclair - "Agriculture, Mining and Manufactures"
6. 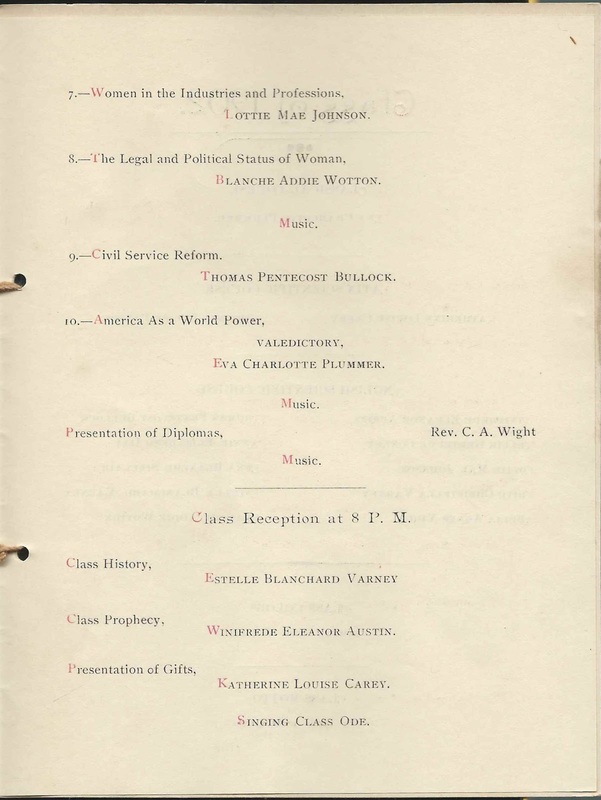 Annie Elizabeth Day - "The Higher Education of Women"
7. Lottie Mae Johnson - "Women in the Industries and Professions"
8. Blanche Addie Wotton - "The Legal and Political Status of Women"
9. Thomas Pentecost Bullock - "Civil Service Reform"
10. Eva Charlotte Plummer, Valedictory - "America as a World Power"
Class Reception at 8 pm. 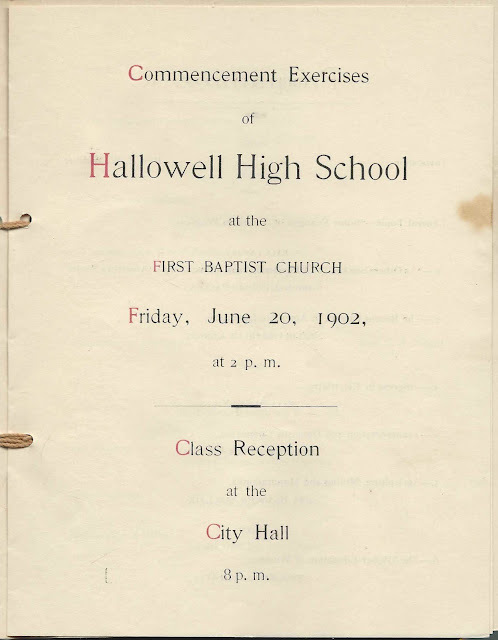 Class Motto - "Non Quis Sed Quid"
If you have information to share on any of the graduates or ministers mentioned above, please leave a comment or contact me directly. 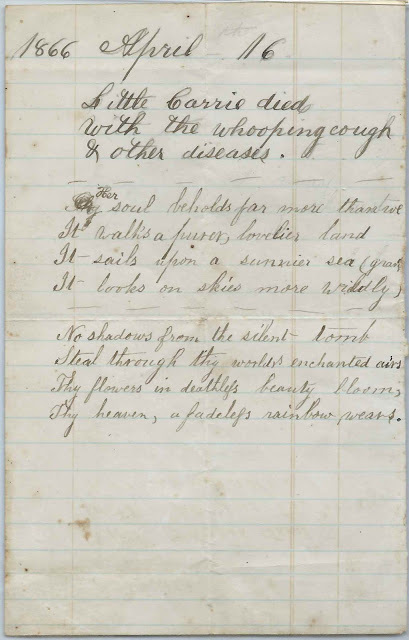 Handwritten Epitaph for "Little Carrie", who Died on April 16, 1866 of "the whooping cought & other diseases"
Paper scrap with handwritten epitaph for "Little Carrie", who died on April 16, 1866 of "the whooping cough & other diseases". Nothing written on the reverse. Much of my collection is from New England and the Maritimes, but this could have come from anywhere. Can you imagine the tears that were shed as this was written? Carrie may have been called "little"due to her very young age, or she might have been a bit older and was called "Little Carrie" to distinguish her from a mother of the same name. If you know of a Carrie who died young on April 16, 1866, please leave a comment or contact me directly. 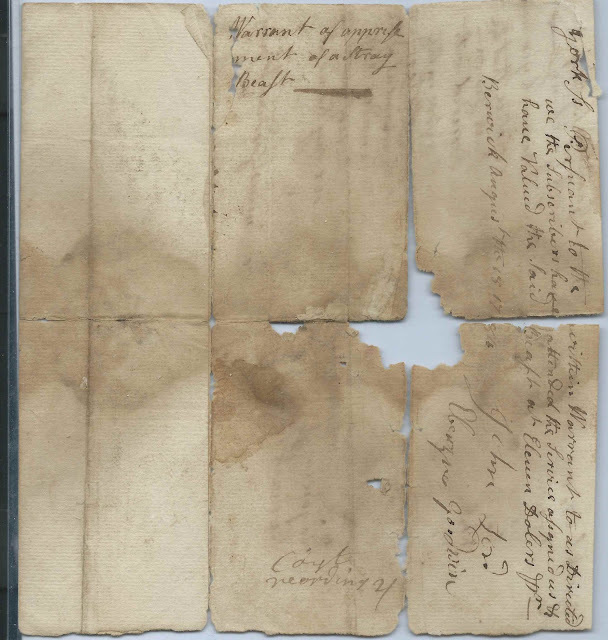 Four documents, ranging from 1815 to 1867, pertaining to Daniel Norton of York, Maine, and one pertaining to Jeremiah B. Norton, also presumably of York, Maine. The document above is an 1825 deed from Joseph Norton to Daniel Norton, presumably the Daniel Norton who was a son of Joseph Norton. 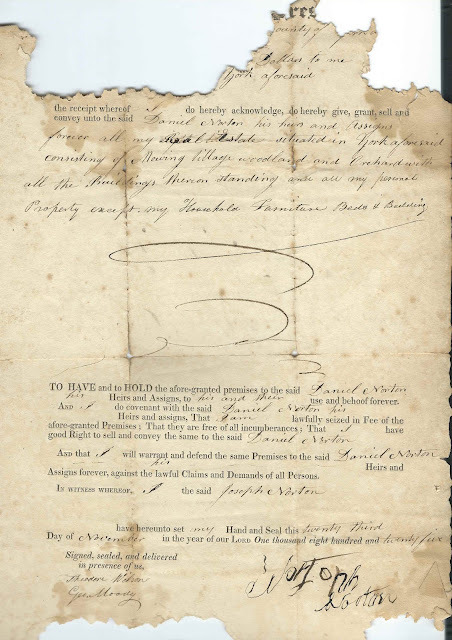 Witnesses to Joseph's signature were Theodore Wilson and George Moody. 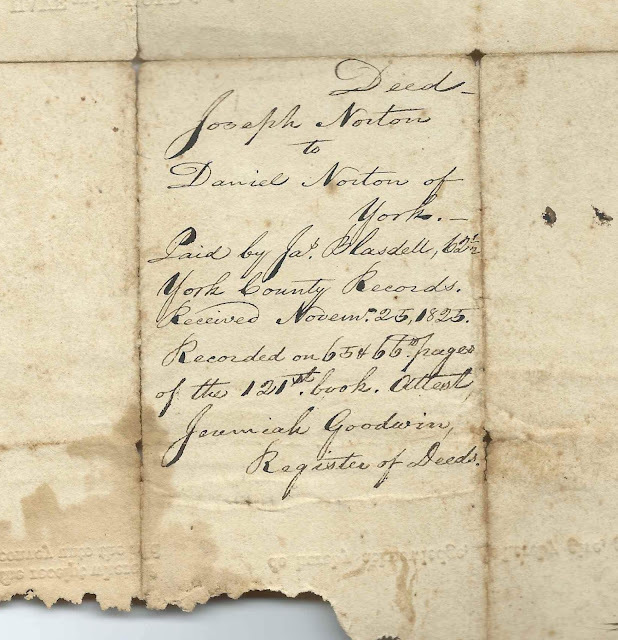 The oldest document is a receipt showing that Daniel Norton had paid his 1815 direct tax of the town of York, Massachusetts - Massachusetts because Maine had not yet become a separate state. The Deputy Collector who signed the receipt was a Goodwin, possibly John Goodwin or perhaps the Jeremiah Goodwin mentioned above. Nothing written or printed on the reverse. 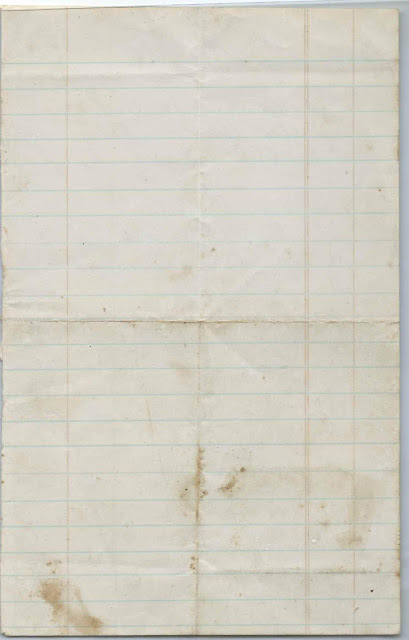 The document below is an 1850 receipt for the payment of Jeremiah B. Norton to Belknap County Mutual Fire Insurance Company. The 1858 document below is receipt of the payment of Daniel Norton to the York County Mutual Fire Insurance Company, signed by Abner Oakes, Treasurer. 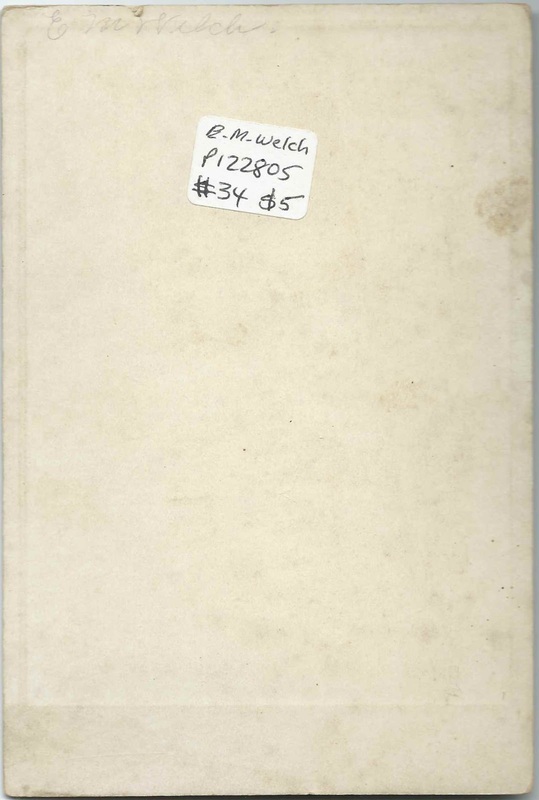 The reverse has a list of losses of members of the insurance company. The last document is a receipt from 1867 showing that Daniel Norton paid in full his State, County, Town and School Tax for the Town of York in the amount of $46.63; signed by ? Junkins. Nothing on reverse. Daniel Norton was presumably the Daniel Norton who was born about 1787 in Maine, son of Joseph Norton and Ada (Nason) Norton. He married twice: 1) Lydia A. (Blaisdell), who died in 1837; 2) Isabella M. Parsons. Jeremiah B. Norton may be the Jeremiah B. Norton (1821-1900) buried in Ocean View Cemetery at Wells, Maine, with wife Mary. If you have corrections to the information above, or additional information on any of the people mentioned, please leave a comment or contact me directly. c1900 document from Calais, Maine, where attorney Charles Bean Rounds is certifying a claim for telephone pole work against the estate of Henry Deane Pike. The form was apparently originally printed in the 1870s; note the preprinted year of 187x. 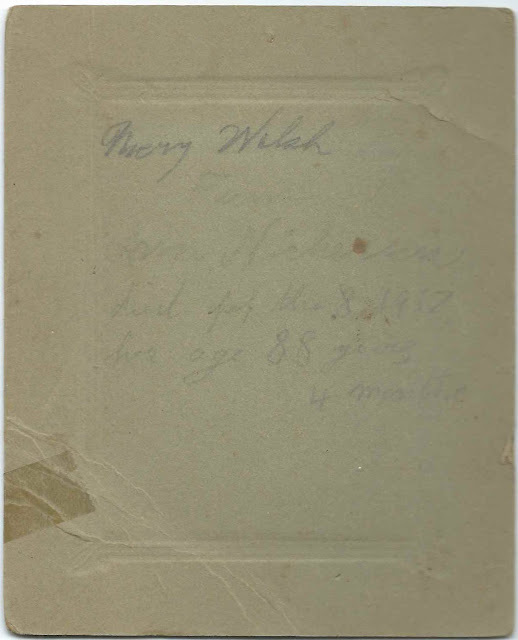 However, between the mention of telephone poles and the fact that a Henry Deane Pike died at Calais in May of 1900, I believe the documents dates from after May 1900. The document measures approximately 8" by 5-1/4" and is folded along the long edge. 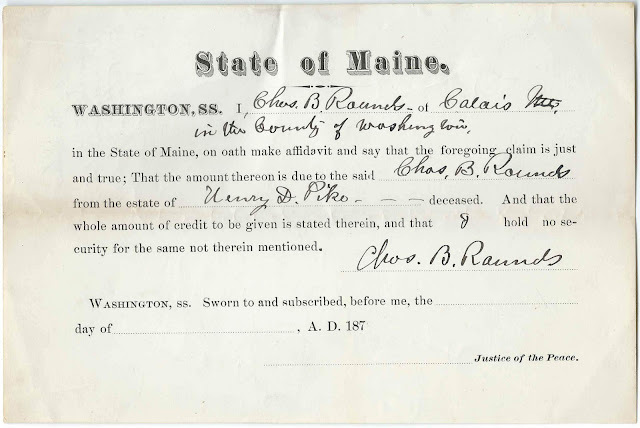 Charles B. Rounds was presumably attorney Charles Bean Rounds, who, according to his birth record, was born December 8, 1834 at Danville, Maine, son of Nathaniel Rounds and Purline (Perley) Rounds, who were born at Buxton, Maine, and Gray, Maine, respectively. After a long legal career at Calais, Maine, Charles died on November 16, 1903 at Calais, Maine. Charles' Find a Grave memorial contains a lengthy eulogy given by fellow attorney Richard J. McGarrigle, which contains much information on Charles' life and career. Henry D. Pike was presumably merchant Henry Deane Pike, who was born August 8, 1848 at Calais, Maine, the son of Saccarappa, Maine, native Samuel G. Pike and Westbrook, Maine, native Ellen (Hickey) Pike, according to Henry's death record. Henry died on May 24, 1900 at Calais, Maine; his Find a Grave memorial gives his birth year as 1849, but that is based subtracting his age at death, 51, from his death year, 1900, without taking into account that he was just a few months shy of his 52nd birthday. If you have more information on Charles Bean Rounds and/or Henry Dean Pike, or if you feel they are different people than described, please leave a comment or contact me directly.